Student Stories on the Seven Wonders of the Ancient World - I Wonder About The Seven Wonders. Do You? By William Dixon and Nolan Olson. 11. I Wonder About The Seven Wonders. Do You? By William Dixon and Nolan Olson. Now you might be asking "what are The Seven Wonders?" Well, we will tell you about two of the wonders of the ancient world. The Wonder I'm writing about is none other than the Great Pyramid of Giza. Now the Great Pyramid of Giza is in Egypt. It was made out of sandstone. Sandstone is a kind of brick made of sand. There is a lot of sand in Egypt. A long time ago in Egypt, there were huge sandstorms. The Egyptian king died. Then Egyptians decided to build the Egyptian king a grave but where would they put it? The Fate of the Great Pyramid of Giza. After all this time, the Great Pyramid of Giza is still standing. We don't know for sure how old it is, but it has been standing for more than a couple thousand years and maybe it will still be standing a couple thousand years from now or a couple million years. All I know is it is still standing today. This was my favorite of the Seven Wonders. But do you wonder about the other Seven Wonders, too? Who built the Great Pyramid of Giza you may ask. Egyptians built it. Not Egyptians like today's Egyptians. These Egyptians lived long ago. But these Egyptians lived in Egypt like Egyptians today. You also may ask when was the Great Pyramid of Giza built? Well experts think it was built in 2560 BCE. That was long ago. I can't even believe it survived since 2560 BCE. How did it survive that long you may ask? Well I don't know. It was built with sandstone. Sandstone is a tough material. But I didn't think it could hold up a couple thousand years or more. I didn't even think it could hold up a couple hundred years. So that was surprising to me. It was actually unbelievable. 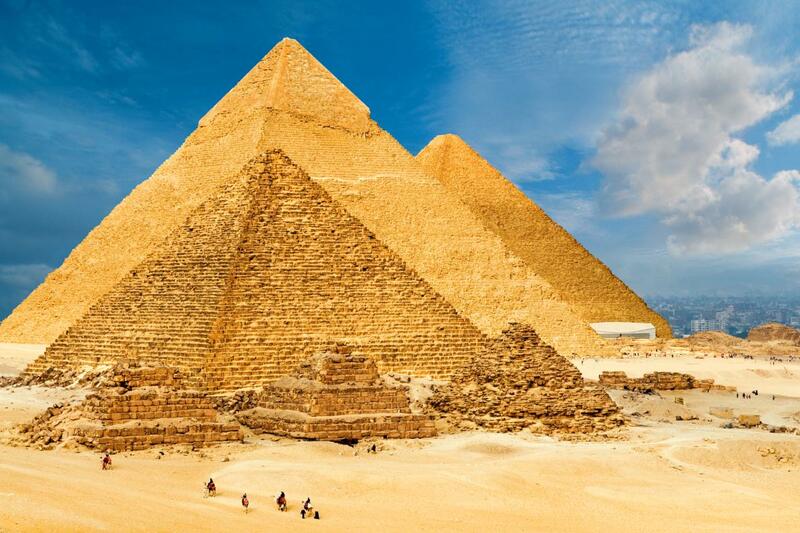 Where is the Great Pyramid of Giza, you may ask? The Great Pyramid of Giza is in Egypt. It is still in Egypt today. The Great Pyramid of Giza is not the only structure in Egypt. There is also a structure called The Great Sphinx of Giza that guards the Great Pyramid of Giza. You also might ask why was it built? It was built to hold Egyptian kings when they died. When the first Egyptian king died, Egyptians wanted to honor him. So after that they built The Great Pyramid of Giza. Ever since then they had a place for when Egyptian kings died. An author inspired me to write about one of the seven wonders of the ancient world. I didn't think I could. But now I know I can. I have been working day by day. But I can write about one of the seven wonders. I picked this one because it was my favorite. Now it's time to ask you the real question. Do you wonder about the Seven Wonders? Where The Great Pyramid of Giza is located. Do you ever wonder about the seven wonders? Well I do, so let’s get to my wonder. The wonder I am talking about is none other than the Temple of Artemis. Now, the Temple of Artemis was made out of wooden frame, gold and ivory. But it was destroyed by fire on July 21, 356 B.C. The Temple of Artemis (aka the Temple of Diana), that became a wonder of the ancient world, was built around 550 B.C. It was created by the Cretan architect Chersiphon. It took ten years to complete and was built to honor the goddess Artemis. Artemis was an Olympian goddess, the daughter of Zeus and Leto. She was the goddess of the moon and the goddess of the hunt. The temple was built after Alexander the Great died because he offered money to build it up again after it was burned. That is why they built it as a memorial to him when he died. Where the Temple of Artemis is on a map. William D. Student, Jaquavious D. Student "I Wonder About The Seven Wonders. Do You? By William Dixon and Nolan Olson." AwesomeStories.com. May 22, 2017. Apr 20, 2019.